After a long delay in 2016 when a company selected to do the work went bankrupt, the “waste land” section of the Bay Run along the Haberfield section next to the City West Link is finished. 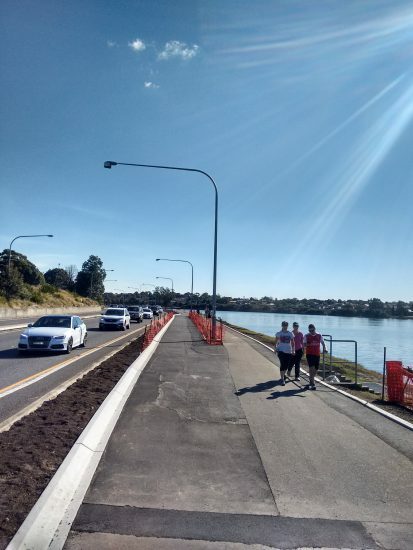 Cyclists have a separate 2.5-3m m wide cycleway, next to a pedestrian path, similar to the rest of the Bay Run, excepting the Iron Cove Bridge, where cyclists and pedestrians share a lane in each direction. There is new vegetation to replace the trees and shrubs removed in 2016. And also an Armco barrier along part of the road from Timbrell Drive, to stop errant motor cars from running onto the bike path, which is very close to the road at some points. The barrier as at October 2018 does not extend the whole length of the new path. As you can see from the image above people on the Bay Run are vulnerable to any motor vehicle running off the road. The diagram below shows the cross section on the project’s planning documents, showing the armco barrier. An Inner West Council engineer told me they would also be improving the section between UTS rowing club and the underpass of the City West Link, where there is currently a sharp bend and a step in the pavement levels. The old timber railings will hopefully go too, as they are about to collapse, and would not stop a small child from sailing under the top railing into the Bay.